Ten of the best for Lady Clarets! Burnley FC Women made it 10-successive wins as they moved eight points clear at the top of the FA WNL Division 1 North. Sarah Greenhalgh scored the only goal against Chester-le-Street Town at their Moor Park Ground, avenging an opening game defeat for the Clarets Women. Burnley FC Women started with the advantage of both the wind and low sun behind, and were quickly on the offensive. On five minutes Chester-le-Street forced Clarets keeper Lauren Bracewell into a diving save to her right, but at the other end, Greenhalgh was causing problems, shooting at goal from a sharp angle. The Clarets maintained the pressure as player of the match Leah Embley (pictured) and Katie Halligan added to the forward momentum, but a goal remained elusive until defender Nicola Shirtcliffe won a corner. The corner was played short by Embley, and a quick passing exchange created the space for Greenhalgh to turn at goal and shoot hard above the keeper. Greenhalgh continued to torment the opposition and was tripped as she cut past players at pace. The resulting free kick by Justine Wallace was fumbled by the keeper. In the final few minutes of the half further controversy surrounded Greenhalgh. As she cut past defenders inside the box, she was pushed off balance with only the keeper to beat and surprisingly the referee chose to wave aside the penalty appeals. Greenhalgh’s game was cut short when she challenged for the ball and suffered a twist to the knee moments before half-time and had to be substituted. In the second half, Bracewell took a shot full in her face, and bravely continued. The Clarets had another penalty appeal ignored when a defender controlled the ball with an outstretched arm. 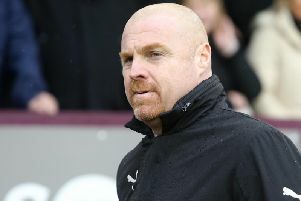 Burnley were nearly undone in the fifth minute of stoppage time when a ball across goal went begging, but the final whistle meant they haven’t conceded a goal in 10 and a half hours of football!